Ozonators are active form of water purifier. It wipes out heavy range of bacteria and makes water safe and clean. We import such kind of ozonators which eliminates various impurities present in the water. Our collections of ozonators are easy to operate, easy to maintain, and low maintenance cost. We distribute our ozonators in many places. We distribute and make sure that product is tested mechanically and electrically so as to reach customers level. 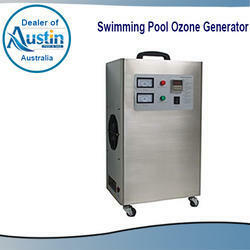 Our Swimming Pool Ozonators are highly effective Swimming Pool Sanitizer Systems. 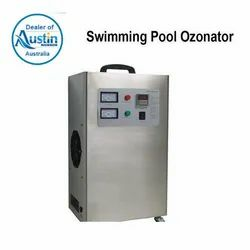 The Ozonators generate Ozone Gas which is injected into the Swimming Pool Water. The Ozone breaks into Oxygen in the water after some time and the free oxygen atom oxidizes the nearby impurities and microbes. This kills all the bacteria and virus in the Swimming Pool. Our Ozonators reduce the Chemical Consumption by replacing Chlorine and hence reduce to less toxic chemicals in the Swimming Pool Water. This reduces harm to the skin , tanning of skin, irritation in eyes and other harmful effects of chlorine. Looking for Swimming Pool Ozonator ?